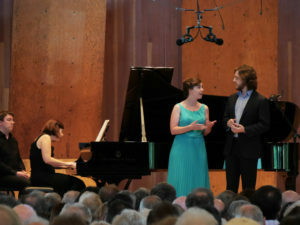 Praised by the New York Times for her “luminous voice” and “intensely expressive interpretations,” and named “remarkable, artistically mature … a singer to watch” by Opera News, soprano Sarah Shafer has earned ever greater accolades since her PCMS debut with Richard Goode back in 2012. Returning next month for her eighth appearance with the Society, this time with the Gamut Bach Ensemble, Ms. Shafer discusses her experience with the Bach Ensemble, performing chamber music, her musical inspirations, summers at Marlboro, and exciting upcoming projects. 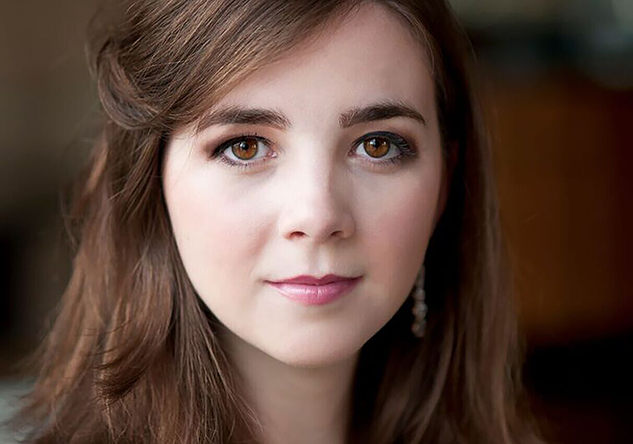 Jessica Wolford: The December 13 Gamut Bach Ensemble concert will be your third appearance with the group. What has been different about each experience? What are you looking forward to for the upcoming concert? Sarah Shafer: This concert is always a highlight of the season for me. The personnel always varies a little bit, so it’s always a joy to work on Bach with new friends. And of course the repertoire changes, so we are always working with a different text, different instrumentation, and different music. But what is more special is what, or who, stays the same. Getting to work with Koji Otsuki, who loves Bach so much and has studied his works extensively, is always an inspiration. His enthusiasm for Bach is infectious, and rehearsals are always such a fun process. It’s amazing to see how the pieces transform from the first rehearsal to the concert. Many of the players are friends from Marlboro, so it feels like a happy reunion to get to rehearse together again. And singing Bach is one of the greatest joys in the world for me, so I always look forward to it! JW: What is it about chamber music that makes you want to perform it, as opposed to being in an opera or larger ensemble? How might you adjust your performance for the different settings and repertoire? SS: I think my favorite thing about chamber music is the communication between players — how if everyone is listening intently to each other, it’s almost like speaking a secret language. I have come to see that ideally this level of communication can happen not only with traditional chamber music, but also in recitals, and even in operas and concerts with orchestra! So I don’t really have a different “chamber music” mode, and I don’t really think about adjusting my performance. I feel like I live my life in chamber music mode, probably from years of honing it throughout high school into college and at places like Marlboro. It’s the best when music making is a two way street, and understanding someone musically and responding to them is just as rewarding as when I am the one being understood and the one to which others are responding. JW: When you first began singing, what or who was your inspiration? Has that inspiration changed or evolved? SS: When I was a little girl, I always had my Mom’s voice in my ear. She was always singing to us in her natural, sweet soprano voice, and I think I subconsciously had her sound as my model. As I got older, it evolved from Disney princesses to Ella Fitzgerald, but my first classical singing inspiration was Kathleen Battle. I wasn’t naturally drawn to opera, but something about the beauty and clarity of her singing resonated with me. Now it changes constantly — often the music itself is my inspiration. Recently I was singing a Mozart Mass, and every time it left me inspired just because of the sheer genius of the music I got to sing! JW: You spent many summers at Marlboro Music Festival. Now that you’ve spent a few summers apart from it, how do you think that experience shaped you as an artist? SS: How hasn’t it shaped me?! I don’t think I can ever name all the ways Marlboro has influenced me. So many aspects of what I do now I learned to do at Marlboro. I learned how to really ask questions of the music, and how to interact with others in rehearsal; I started an acquaintance with so many pieces that have since become close friends. Not to mention how many actual human friends I have from Marlboro! Not a year goes by but I am making music with someone from Marlboro — in many ways, I feel like I never left! It is always a place I think of with much gratefulness and love, for the gift of being able to make music there. JW: Lastly, tell us about the exciting upcoming projects you’re working on this season. SS: I am singing my first role at the Met this spring, the role of Azema in Rossini’s Semiramide, so that will be very exciting for me! I’m also doing an alumni recital at Curtis in March with Mikael Eliasen, and singing with the Detroit Symphony and the Oregon Bach Festival this summer. 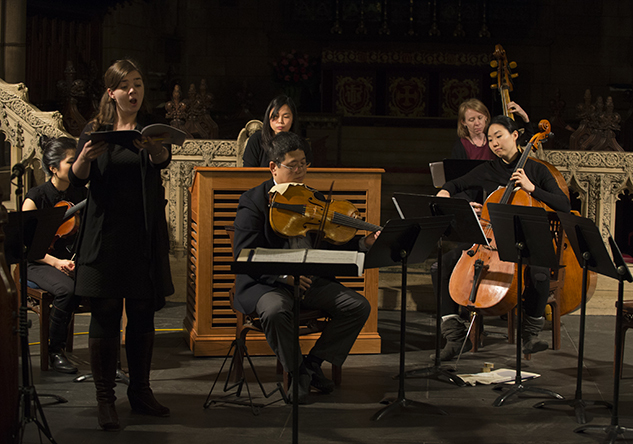 Sarah Shafer performs with the Gamut Bach Ensemble on Wednesday, December 13 at 8pm at the Church of the Holy Trinity. For more information and tickets, please visit the concert page. For more information on Ms. Shafer, please visit her website.